Reed diffusers have become all the rage for air freshners as well as designer room decorations. The prices vary drastically, but most are very spendy. You can save yourself a lot of money by making your own. Or, if you have an existing product line, increase your sales by adding reed diffusers. Compatibility: This is an important step which a lot of people (including manufacturers) miss, but it is important because if your fragrance is not compatible, there is no way for your reeds to pull the fragrance up. 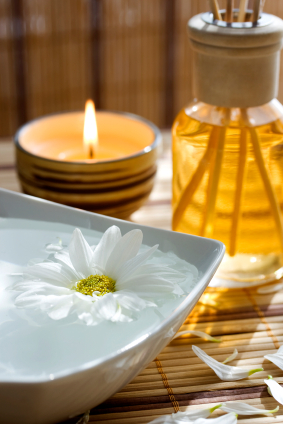 The reason we use Fragrance Oil Enhancer, or Reed Diffuser Carrier Oil, is because Fragrance Oils are very thick. They are too thick to travel up a reed by themselves and so they need a carrier oil. If you do not dilute your fragrance oil, your reeds can not soak it up and will not have much, if any scent throw. If you see your reeds sitting in two layers, then you know your fragrance is not being carried up the reed, only the diffuser oil. To test your compatibility, place an equal amount of fragrance oil and fragrance oil enhancer into a clear container, like a test tube, and shake. Allow to sit for about 5 minutes. If you see 2 layers, it means they are not compatible. At this point you have 2 options. You can test again with a lower amount of fragrance oil -- say 25:75 ratio -- or just not use that oil. Fragrance Oil Enhancer does not do well with cinnamon based fragrances, like Red Hot Cinnamon, so if you are using a cinnamon type oil, you may want to test with a lower ratio than 50:50 to start with. Once you have tested the compatibility of your oil, you are ready to go! Simply measure 1 part of fragrance oil enhancer to 1 part of fragrance oil (or adjust your ratio to what you discovered during the compatibility test). You can do this by weight or by volume, either will work. So, for instance, you can use 1 oz of Fragrance Oil Enhancer to 1 oz of Fragrance Oil, or 2 tablespoons of Fragrance Oil Enhancer to 2 tablespoons of Fragrance Oil. You can add a single drop of liquid candle dye at this stage. Pour into your bottle and shake well. Add your Reeds, wait one hour and flip them to help the oil travel up the reed faster. You now have yourself a lovely Reed Diffuser in a fragrance you love! Over time, your reeds will lose their fragrance. Flipping them end to end will help restore the fragrance. Eventually your reeds will clog completely and you will need to replace them. You can add new fragrance at any time with existing reeds. Once the new fragrance travels the length of the reed you will have the new smell.